Green Lantern is of course the DC comic book superhero who is part of the Green Lantern Corps, an intergalactic police force of sorts. This full-length made-for-DVD animated movie is an "origins" story in which it is retold how a test pilot named Hal Jordan came to be in possession of the ring powered by alien technology that gives him superpowers as the Green Lantern. 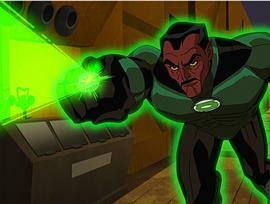 To be honest about five minutes of the movie is concerned with how Jordan came to be the Green Lantern. The rest is a sort of Training Day in outer space as Jordan is shown the ropes by a fellow Green Lantern named Sinestro who turns out to be a bad guy (no surprise there - what do you expect with a name like that?). Sinestro thinks that the so-called Guardians of the Universe - the blue-skinned alien geezers who are the Lanterns' bosses - are too soft on galactic crime, which probably makes him a Republican or something. Jordan has to foil his plot to usurp the Guardians even though no-one trusts him because he is the new guy. Lauren Montgomery who did Wonder Woman, the previous DC Universe flick, directs the movie. Wonder Woman turned out to be an unexpectedly fun outing largely thanks to some welcome humor and a nice comic turn by Nathan Fillon of Firefly fame as Wonder Woman's male cohort. (Or is that sidekick?) Unfortunately the sense of fun and humor that made Wonder Woman so enjoyable is largely missing from Green Lantern - First Flight. Clocking in at a mere 77 minutes, Green Lantern is action-packed right from the start, but the action comes at a price: not much effort is made to make Jordan an interesting or even likeable hero. In fact he is an excruciatingly one-dimensional character that is simply swept along from one action scene to the next. Maybe a slightly longer running time would have benefited the material more - perhaps some scenes early on in which Jordan maybe has some difficulty getting to master the ring's powers. Or maybe misuse them for some minor personal gain - maybe getting back at the guy who cuts in front of during peak hour traffic or something. Anything! After all, what would you do if you came into possession of a ring like that? Such scenes would make Jordan a bit easier to relate to as a character. Also, the movie is rated PG-13 largely thanks to some unnecessary violence and "strong" language. This is a pity because the plot and the material never really rise above that of your average Saturday morning cartoon. There is nothing "adult" in it to be honest and it is a shame that smaller children won't be able to watch it. 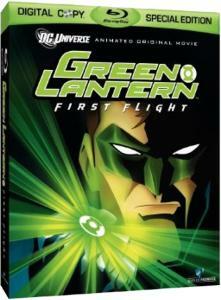 So file Green Lantern - First Flight under "disappointing, but not outright bad" - a bit like many of the DC Universe Original Animated Movies line released by Warner Premiere and Warner Bros. (This film is the fifth movie in the series. (The others were Superman: Doomsday, Justice League: The New Frontier, Batman: Gotham Knight and Wonder Woman. Next up is Superman/Batman: Public Enemies in September 2009). After all the animation is up to the high standard one would expect of a movie in this series, the voice talent is adequate and it never really bores. Well, not too much anyway. THE DISC: The movie could have been better than it is, but the disc is worth it if only for the five bonus Justice League cartoons picked by producer Bruce Timm. That is of course if you don't already have them on disc. Any of these episodes are actually better than the main feature itself because they spend some time on characterization, even if it is in the passing by. The extras made especially for this release is on the disappointing side when compared to those found on previous DC Universe flicks. 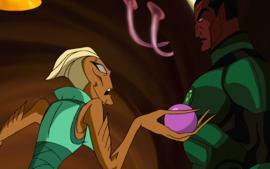 A feaurette promising to ?look at the symbolism of the ring in literary lore as reimagined for Green Lantern? turns out to be nothing of the sort. A lot of talking heads on display, but it is good to see that talented comic book writer Geoff Johns is quite a busy guy as of late. Johns penned the upcoming Blackest Night, "the epic DC Comics super hero event in which the dead rise." Sure, it sounds a bit like Marvel Zombies, but we're certain Johns will pull off something worthwhile. WORTH IT? Not if you already have the five bonus Justice League episodes bundled with this disc. RECOMMENDATION: Rent it if you're into comic book superheroes. If you seriously want to purchase it, go for the Blu-Ray which is only marginally more expensive than the two-disc DVD edition. NOTE: Am I the only one who is irked by Blu-Ray's so-called "superior" menu navigation system, especially on smaller TVs on which the text become illegible at times? Sure, I know one is supposed to watch Blu-Ray discs on a huge TVs, yadda, yadda, yadda. But this sort of elitist attitude only means that this is a format that will ultimately struggle to gain mainstream acceptance. Read our interviews with Green Lantern's director & actress Juliet Landau.